Posted in: Art, Music, Photography. Tagged: Benjamin West, ca. 1796, Nelson-Atkins Museum of Art, Oil on canvas, portraiture, Raphael West and Benjamin West Jr., Sons of the Artist, Suite Bergama Debussy. Pennsylvania native Benjamin West was elected in 1792 as president of the prestigious Royal Academy in London, where he had been a resident since 1763. Although the artist's fame depended on history paintings, he painted numerous portraits of his family, including three of his two sons, Raphael and Benjamin, Jr., together. 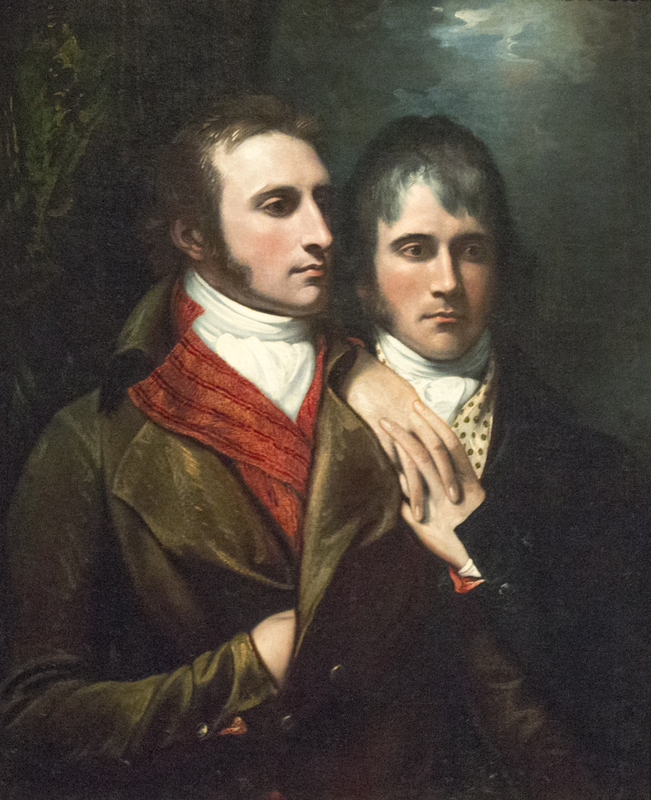 Here the artist's sons appear as sober young men. Even so, their mutual affection is apparent in their relaxed, intertwined pose. The dark shadows and moonlight in the background add a melancholic mood typical of the Romantic sensibility that was gaining popularity in the late 18th century. Both of West's sons worked in their father's studio. Neither man, however, had substantial success as an artist. The pose with the hand inside the jacket reminds me of the portrait of Napoleon with a similar pose. Made me wonder if this was just a thing done just for portraits or if men actually stood around like that. In either case it seems kind of silly. That it turn made me wonder what 21st century mannerisms we have that would seem silly to someone in the 18th century. I hadn’t noticed but they do seem a bit long and slender. As I was walking away from my computer a thought struck me. Maybe, unlike his brother, the brother on our left had very unfashionable short, stubby fingers and his pose was not an affectation but his desire to hide his fingers. An amazing portrait painting, every detail immaculate. I agree with David, the posturing of the subjects is outdated, I’m sure it was in style in the 17 and 1800’s, considered very elegant. I also feel pretty sure the artist controlled all aspects of this portrait. Lovely art, Maverick. His sons look perfectly perfect in every way! Fab painting!